Will There Ever Be Reforms in Bulgaria? This year's country-specific recommendations of the European Commission show a very clear trend - the countries that need reforms the most conduct them the least. Bulgaria is one of them. The economic committee of the European Parliament has summarised in a separate document, in a very telling way, precisely (non)compliance. 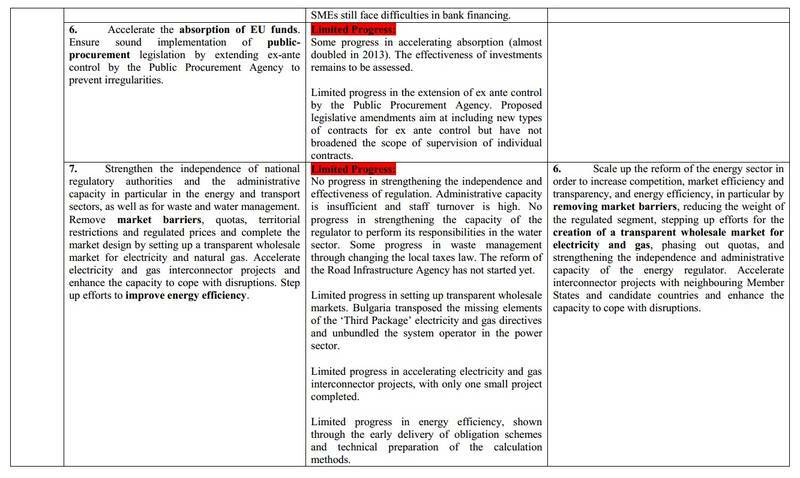 As euinside forecast recently without any trouble, in Bulgaria there is no progress at all on the seven specific recommendations this year just like last year, although they are key and very important to enable the country handle several fundamental problems. Although positive, the economic growth is weak and cannot be a single solution to these problems. The biggest challenges Bulgaria is facing, according to the European Commission's assessment, are tax compliance, tax collection, the quality of tax administration, the scale of shadow economy, ageing population (the most rapidly ageing in the EU), unemployment, especially among young and Roma people. Bulgaria is among the countries with the highest risk of poverty and social exclusion in EU. The public administration is sluggish, the judiciary is not independent, corruption is widespread, energy dependency makes the economy uncompetitive. 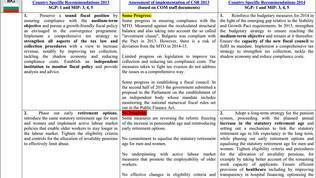 In 2013, the government has done nothing to implement the Commission's recommendations. The conclusion in the analysis that the country still lacks a comprehensive tax compliance strategy, the administrative costs for tax collection and tax compliance are high. 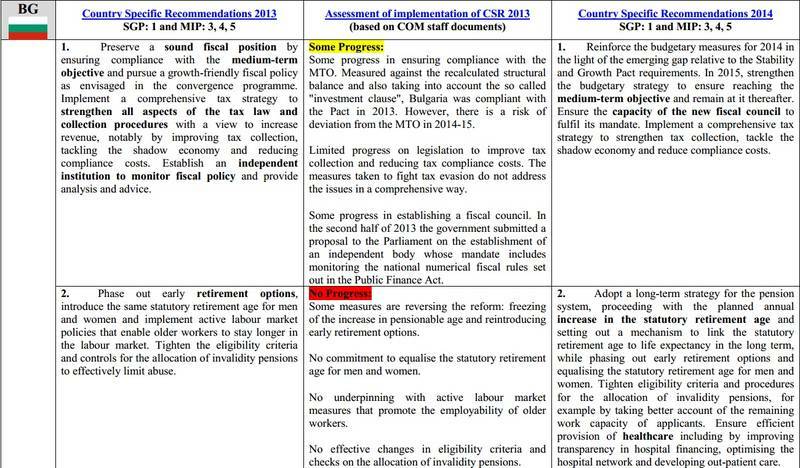 In terms of pension reform, Bulgaria has not only done nothing but it rather made a step backward. The additional early retirement schemes have been reinstated and the planned annual increase of the mandatory retirement age has been postponed. There is no progress in terms of equalisation of retirement age for men and women as well. "Bulgaria has one of the most rapidly ageing populations in the EU, which has negative implications for the labour market, for growth potential in the economy and for the financing of its pension system. Bulgaria therefore needs to continue the reform of its pension system", the report that accompanies the new/old recommendations says. Unemployment has frozen at a certain level in 2013, but the number of young and long-term unemployed has continued to rise. "Bulgaria faces one of the highest proportions of young people who are neither in employment, education nor training, implying a severe underutilisation and underdevelopment of human capital", the Commission believes. There are still no clear criteria for transparent setting of the minimum working wage which has been significantly increased in 2013 and can possibly have negative impact on employment. That is why, the Commission believes that it should be monitored closely. The School Education Act has still not been adopted, as the key phrase here is "still not adopted". This year, too, just like last year, the Commission points out that Bulgaria needs a coordinated strategy for a public administration reform with a focus on increasing professionalism and independence and also focusing on regulatory agencies where meritocracy needs to be introduced (merit-based appointments, not politically motivated or nepotism). The Commission has also found lacking efficient structures to tackle risk of corruption. The independence of the judiciary continues to be a "big concern" that affects the business environment in Bulgaria. The analysis reports that some steps have been undertaken in this direction, but, overall, progress is limited and fragile. There are no sufficiently convincing sanctions when conflict of interest is verified. Competition in the sectors of electricity and gas remains limited, the Commission repeats its assessment from previous years. "Areas of particular concern for improving the functioning of the energy markets include the lack of electricity and gas exchanges and the absence of a transparent wholesale market". 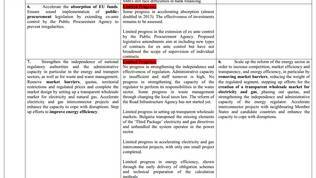 This year, the problems Bulgaria is facing fit into six recommendations instead of seven. Regretfully, the Commission is not very elaborate as in the case of Croatia, for instance, and has not put forward specific deadlines, excluding for recommendation number one. 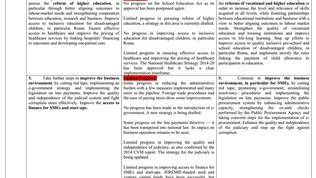 In it, it points out that in 2015 the budget strategy needs to be enhanced with a view to achieve the mid-term target and to maintain it further on. The new fiscal council needs capacity building to be able to fulfil its mandate in a fully fledged way. Also needed is a comprehensive tax strategy to enhance tax collection and tax compliance, to tackle shadow economy and to reduce the administrative costs. The second recommendation is to adopt a long-term strategy for reform of the pension system as the earlier planned increase of the mandatory retirement age should continue, but mechanisms that link it with life expectancy are also needed in the long-term. The early retirement possibilities need to gradually be abolished and to move toward levelling of the retirement age for men and women. 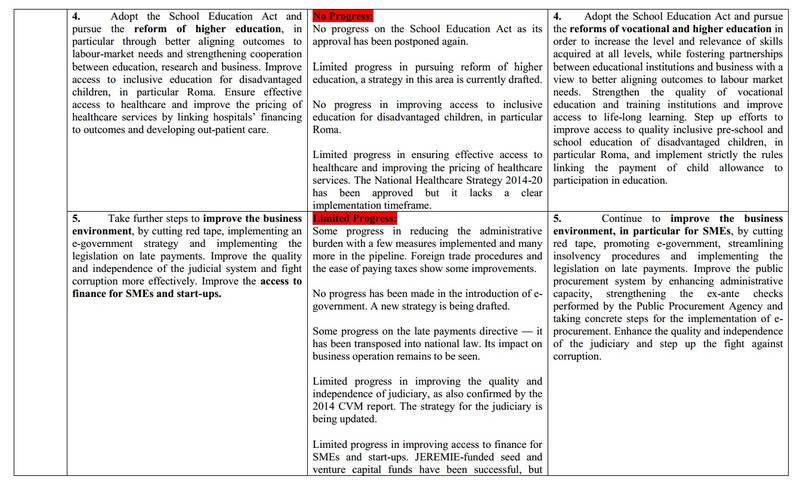 This recommendations renews the expectation efficient health care to be ensured with a focus on improving transparency on hospitals funding, optimisation of the hospital network and development of out-patient care. 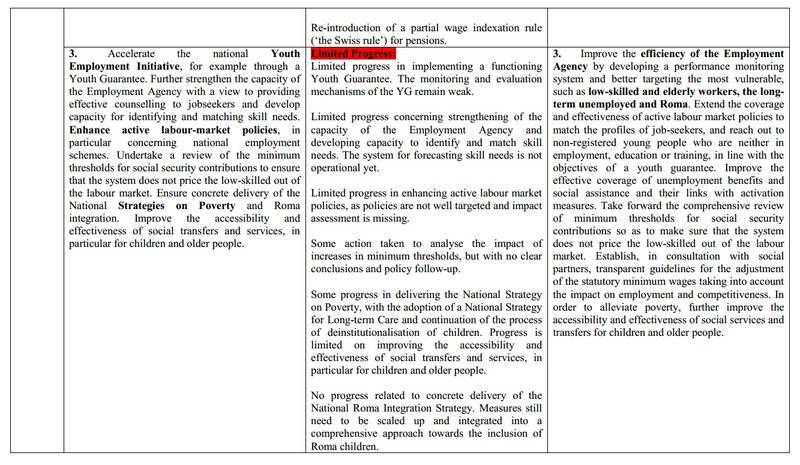 The third recommendation, too, remains the same, which is to review the minimum social contributions thresholds to ensure that the system does not hold low-skilled workers outside the labour market. The Bulgarian government, whichever that might be, is expected to define after consultations with the social partners transparent guidelines for adjustment of the minimum wage taking into account what implications it could have on employment and competitiveness. In order to reduce poverty, the access and efficiency of the social services needs to be further improved, which includes the benefits for children and elderly people. And finally do adopt the School Education Act! This is the fourth recommendation which is supplemented by pieces of advice for reform of the high education and training systems, to create partnerships between education institutions and business, to enhance the quality of training and improve the access to life long learning. Great attention has to be paid on children and especially those from Roma origin to avoid early school leaving. Alas, although the recommendation is persisting, it is worth bearing in mind that apart from adopting the School Education Act, finally, it should be ensured that it is an act of quality. The Commission, however, has left this to the national authorities. In the fifth recommendation, it is again repeated the need to improve business environment, especially in terms of small and medium-sized enterprises through abolishing red tape, creating e-government, alleviating bankruptcy procedures and apply the late payments legislation. The system for public procurement (again and again) needs to be improved by enhancing the administrative capacity and increasing the ex-ante checks of the Public Procurement Agency. Sixth is the recommendation to begin a reform of the energy sector to enhance competition, market efficiency and transparency. The fact that the Commission has been repeating these recommendations over and over again is very alarming and it is highly advisable to avoid calming down with the fact that other countries, too, do not implement the Commission's specific recommendations because other countries might be having very serious problems, but Bulgaria still is the poorest EU member state, with the most rapidly ageing population and with the highest risk of poverty and social exclusion. The recommendations that we read a third year in a row are actually insulting because they show two things. Either consecutive governments are incapable of doing reforms or they deliberately do not do them. Whatever the reasons, the reality is this - Bulgaria is in a poor condition and doing nothing does not at all freeze the situation at a certain level. On the contrary, the more nothing is done the more problems deepen and escalate. This year's recommendations to Bulgaria can safely be perceived as aimed at Bulgarian voters, too, who, as it is now evident, might again go to the polls this year. So, the seventh recommendation is by euinside. 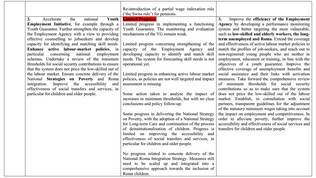 Dear voters, these recommendations are for you too. It depends on you to choose more of doing-nothing or you can focus on people who show firmly that they are aware of what needs to be done and tell you how they plan do it. You should use these recommendations as your guiding light when choosing representatives in Parliament and when you support parties not because the Commission says what needs to be done, but because this is the only independent of vested interests analysis of the situation of the Bulgarian state, society and economy. And while you are thinking about the daily things in your life, do not forget that tomorrow those who contribute for these daily things could be much less because of emigration, ageing or for being part of the socially excluded minorities whose access to education and labour market is limited. You should also not forget that in the current situation, the problem is far from being about whether we love Russia or not, whether the EU is good or US bad. It is only about the fact that Bulgaria is among the few member countries who pay the highest price for energy which is a burden for producers and erodes the income of the poorest. Besides, Bulgaria has the lowest income per capita not because it has still not found the right person who will over night raise wages, but because it has not found someone who can create conditions wages to begin growing in a natural, economically based way. The choice is tough, this is a fact. That is why, euinside recommends you to be demanding. To everything and everyone and most of all to yourselves. After all, it is your future that is at stake. I have bad news for the European Commission: you cannot have your cake and eat it too. If the mandatory retirement age is to be tied to life expectancy, then men should retire earlier than women - since universally (and that includes Bulgaria) men have shorter life spans than women. (The 2011 figures for Bulgaria are 70.8 years for men and 77.8 for women.) But if Bulgaria is to be required to move toward levelling of the retirement age for men and women, then the mandatory retirement age cannot be linked with life expectancy. Sorry, but that’s the way it is.